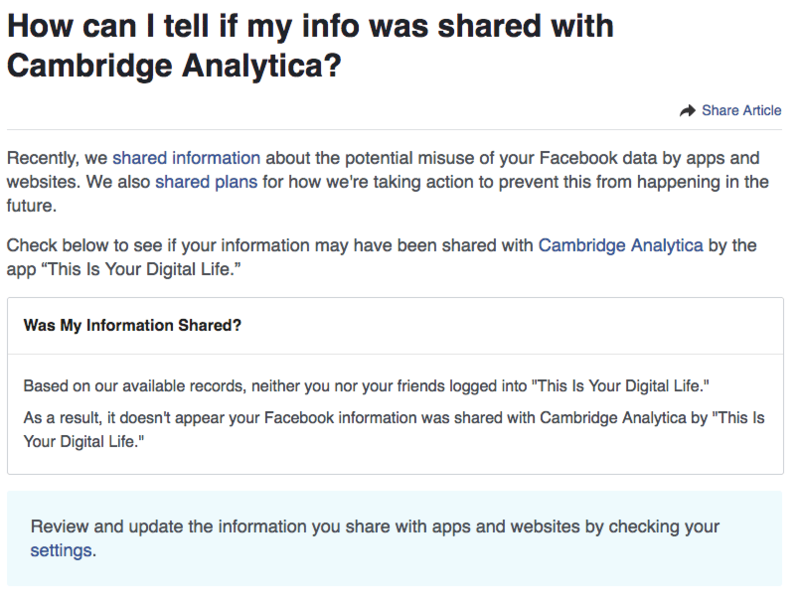 Home › Blog › Did Facebook Share Your Data With Cambridge Analytica? Unless you are living under a rock, you probably have heard all the news around Facebook and Cambridge Analytica. Specifically how your data may have been shared with them and maybe Russia. Supposedly 87 million users may have been impacted by this. It was not a "data breach" or security issue, but rather Facebook's very own API and SDK allowed for this back in the day. Technically, the way the data was ultimately used was against Facebook's terms of service but still. To check if you are one of those 87 million users, Facebook set up a page to tell you over here. You need to be logged in to see the result, of course. It will tell you if the app that captured this data was ever used by you or your friends. So make sure to check it out and if you were part of the group, I am not sure what recourse you have outside of likely several class action lawsuits where you might make enough money for the postage you are using to mail back the class action form.